Recently I have become very concerned about the issue of climate change and how it is effecting the ocean. 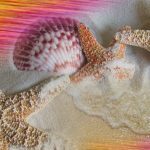 My digital collages have explored the beauty and serenity of sea shells and seashores with photography and scanned acrylic painting. Because of this work, it was an easy transition for me to make a statement using similar digital techniques, and visual elements of sea creatures and bodies of water. I have photographed imagined beaches that are composed of starfish, sea urchins and other shells. They are digitally blended with the bright color of acrylic painting. The effect is a spectacular show of lights that flow across a tranquil shore. These drawings explore the beauty of the shell. They continue my exploration of organic forms, abstract and representational. I have blended charcoal shell drawings, digital paintings and photographs. Colors of turquoise, purple, green and gold evoke ocean and sand. This series takes the viewer through a nontraditional voyage of the four seasons. For example, photographs of bright tulips and summer lilies float on bare trees. Brilliant autumn colors and shapes come alive, in surprising compositions. 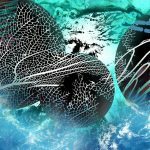 This digital art series began with photographs of clouds and trees. When the photos were collaged, they surprisingly morphed into full moons.